Floss picks, also known as floss sticks, have slowly but steadily established themselves on the market. Designed with customers’ convenience in mind, floss picks have pushed out flossing strings as the number one plaque removal tool. 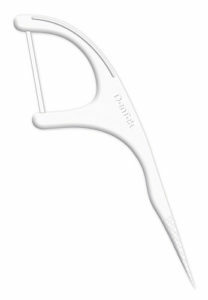 Smartly designed to hold the floss for you, so you only need to use one hand, these picks come in one form only. Their body is made out of plastic material with a U-shaped curved tip. The tip, is where the actual floss string is attached. Don’t ask me how, it is all dark magic to me. Gone are the days when you needed 20 centimeters of cord in order to floss. The cord on these picks measures around 1 centimeter. You can use it to floss all of your teeth at once. Simply rinse the string every now and then in order to remove food particles that may have gotten stuck to it. The phrase “rinse and repeat” comes to mind. In this regard, a floss picks are deliberately intended to look like a tiny toothbrush. The little handle eliminates the need to wrap a floss around your fingers while flossing. It also frees up your other hand, in case you want to watch a Youtube video, while going about with your daily dental hygiene. The majority of flossing sticks measure around 5 inches. As such, they are quite convenient to carry around when you travel. However, do not forget that these are meant for single use. So, if you are travelling for a week and you are used to flossing twice a day, you would need to pack at least 14 little flossers. This should not be a problem, as most packs contain 100+ picks. Some manufacturers have smarten up, and offer a 2-in-1 design. Meaning, that bottom of the stick is sharply designed so you can use as a toothpick. I guess innovation never sleeps. Unfortunately, floss picks are not always glorified. Convenience often comes at a price. In the dental world, if I may call it that way, there is a phrase “conscious flossing”. It refers to one’s awareness about one’s mouth hygiene. An important step of conscious flossing is that each flossing site (the space between separate teeth) is treated with a clean segment of floss. In other words, if you are using 20-30 centimeters of flossing cord, you can dedicate separate segments to separate teeth. Many times using a clean piece of floss does not simply remove food particles. It also has the ability to show us if there is infection between the teeth. When the same string is used on all teeth, it becomes hard to tell. Floss sticks can also be quite tough on sensitive gums. This is because their cord is very short and lacks the ability to wiggle between the teeth. Tight contacts between teeth are hard to floss as it is. Sometimes you need to wiggle the long string back and forth in order to avoid snapping it into your gums. This is very hard to do with a flossing pick. The short string often ends up being pressed too hard into the gum pocket. Using the same piece of floss between all of your teeth can also spread bad bugs into the healthy parts of your mouth. This is perhaps the number one argument against floss picks. Bad bugs, infections and bacteria does not sit and wait around. Once it clings onto the cord, it can easily and quickly find its new home elsewhere in your mouth. Last, but not least, these are single use plastics. Reducing the use of such plastics is essential to our global environmental efforts of saving Mother Earth. It is unfortunate, but if you look hard enough you will begin noticing floss stick all around you. People seem to think that it is okay to dispose of this kind of plastic anywhere on the street. You might find this article on expanding floss interesting. It is yet another alternative to regular flossing. Also check out our reviews of water flossers here.